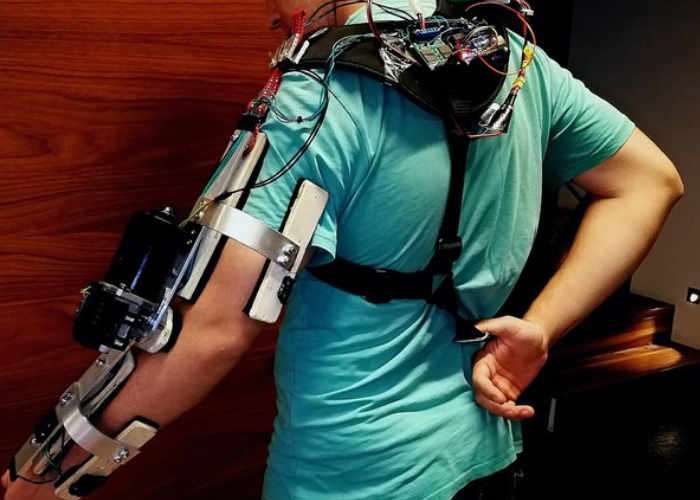 Using just $100 worth of parts Kristjan Berce has created an awesome Arduino powered assistive exoskeleton arm. The arm mechanism is controlled using an Arduino Uno which has been combined with a windscreen wiper motor. The creators of the $100 exoskeleton arm explain more about the design and its development. We are developing a relatively cheap, simple and yet powerful exo-arm design that will allow for a easy usage, which is especially important for elderly and other people who need this kind of help in everyday life. The development of this project is beginning to focus itself more on the control of the arm, then the design itself. So, maybe our n.1 goal will be to make controlling the ExoArm as cheap and as intuitive as possible.Processing will is done with an Arduino, so the code will be fairly easy to understand and modify when wanted.Current prototype will feature an motor on the elbow, but in further designs we will also implement a shoulder actuator. The exo-arm will have back support, so that all the weight will be evenly distributed to your body. Lifting capacity will be around max 10kg or 22 pounds.